A coma prone Englishman (Ray Milland) with a pathological fear of being buried alive goes to extreme measures to prevent his greatest nightmare from coming to fruition. Premature Burial, Roger Corman's third adaptation of an Edgar Allan Poe work, offers an inventive screenplay (considering Poe's story was more of an informative on catalepsy) whose collaborators including Twilight Zone veteran Charles Beaumont. In addition, the film boasts wonderful set design which includes a memorable tour through a "survival" crypt. Milland's performance is enjoyable, especially when he atypically ranges out in the heightened conclusion. A student takes a respite at an old hotel and quickly is haunted by a bloodthirsty female vampire. 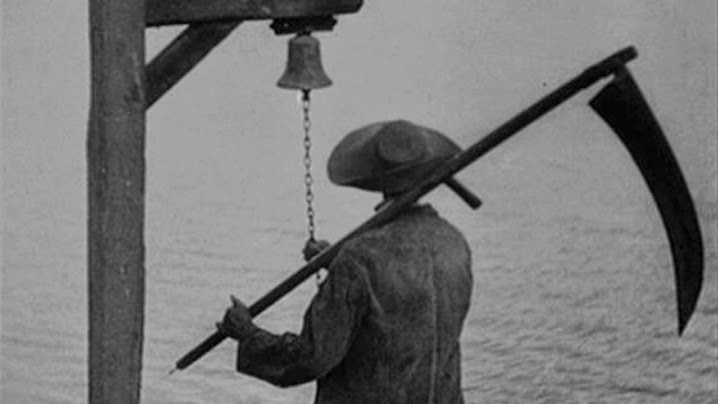 Though made several year after the introduction of talking pictures, Carl Theodor Dreyer's Vampyr is a mostly silent, disorienting, dreamlike exercise. Based on the short story Carmilla by Sheridan Le Fanu, the film is virtually plotless, but is incredibly atmospheric with Dreyer's brilliant direction making fantastic, horrifying use of light and shadow. The director of an insane asylum travels to a small German town with his muted, semi-catatonic assistant where he performs sideshows and uses the sleepwalker to commit a series of grisly murders. The Cabinet of Dr. Caligari is a cornerstone of silent cinema and German Expressionism which remains widely influential to this day. 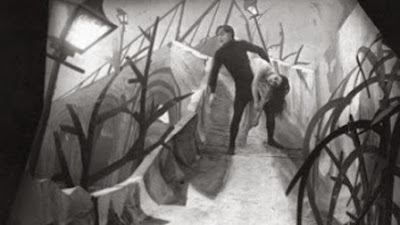 Robert Weine’s film, which was co-written by Carl Mayer and Hans Janowitz, is suspenseful, wildly imaginative, and bizarre which extends to the atypical titles, mind bending sets, and overstated actors. A centuries old vampire (Tom Hiddleston) lives alone in his decrepit, isolated Detroit home, separately from his Mediterranean stationed wife (Tilda Swinton), where he composes popular rock ballads and relieves the local hospital of their choicest O-negative stock. When the couple senses sorrow in each others voices over the phone, they decide to reunite but find their visit interrupted by her reckless younger sister (Mia Wasikowska). Jim Jarmusch's Only Lovers Left Alive is well crafted, and a nice rebuke to the onslaught of vampire movies which seems to have cooled as of late, but wears thin and begins to plod after awhile. Hiddleston and Swinton are immensely appealing. 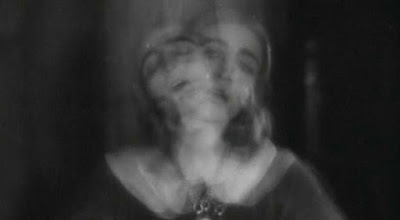 Jean Epstein's early, silent take on Edgar Allan Poe's popular short story, with the head of title house receiving a visitor and, along with his sister, giving way to melancholia and madness, is a surrealistic, unsettling, and nightmarish experience. 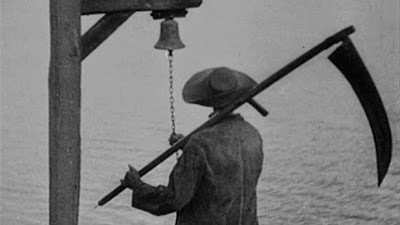 Unconcerned with narrative continuity or traditional storytelling approaches, The Fall of the House of Usher is an atmospheric triumph abetted with the aid of many incredibly effective and what have to be (at least in a few cases) introductory camera techniques. A window into the life of the megalomaniacal Apple visionary as told in three acts in the frantic moments leading up to three launches (the 1984 Mac, the introduction of 1988's NeXT computer, and the iMac in 1998) as he strategizes, confronts, insults, embraces, threatens, or demeans several major players in his life including his faithful assistant and conscience Joanna Hoffman (Kate Winslett), head programmer Andy Hertzfeld (Michael Sthulbarg), close friend and pc pioneer (Steve Wozniak), former Pepsi chair and current Apple CEO and father figure John Sculley (Jeff Daniels), and Chrisann Brennan, a troubled ex-girlfriend (Katherine Waterston) whose daughter Jobs initially denies paternity of. An endless source of fascinating, the latest Steve Jobs movie (and hopefully the last) was hatched by top industry talent. At first, Aaron Sorkin's relentless, droll, sometimes forced dialogue and Danny Boyle's kinetic, stylistic approach do not seem to mesh, but they eventually gain footing and even approach greatness, especially in a second act brilliantly edited and acted wrangle between Fassbender and Daniels. Although to my mind Michael Fassbender seems miscast, he appears to come close to the core of his enigmatic and in many ways despicable character and is given truly fine support by a uniformly excellent cast. As war reaches their unnamed African village, a young boy's (Abraham Attah) mother and younger siblings make their narrow escape for refuge while his father and older brother are gunned down by the pillaging invaders. Scared and alone, he is picked up by a rebel militia, led by a sadistic, imbalanced commandant (Idris Elba), where he begins his life as a child soldier. Even with its unthinkable, harrowing subject matter, Beasts of No Nation both generally resembles films of the same ilk or feels like pictures we've seen before (War Witch and City of God spring immediately to mind). Director Cary Fukunaga successfully adapts Uzodinma Iweala's novel into a nightmarish, intelligent though overlong film which could have benefitted from tauter editing and loses steam in its second while typically making fantastic usage of shooting locations. Elba delivers a towering, complex, and menacing performance while child actor Attah does quite well with a extremely demanding role. At the height of the cold war, a pragmatic insurance attorney (Tom Hanks) is tapped by his firm to defend an overwhelmingly guilty, both by the questionably attained evidence and in the fervant court of public opinion, stoic Russian spy (Mark Rylance) to present an international view of fair treatment. Shortly after procuring a relatively light sentence for his client and becoming a much maligned figure in the press, the counselor is once again called upon to travel to East Germany to negotiate for the swap of an American spy pilot, recently shot down behind enemy lines. Bridge of Spies is a well made though overlong spy pic, intentionally drab and dreary, crafted in the vein of a John le Carre quasi thriller by the Coen Brothers along with Matt Charman. In spite of the material and its intentions, its director still strives for nauseating Spielbergian moralizing and uplift, with a first act that plays like a civics class and a second which isn't as dramatically pulling at it should be. Hanks is well cast, putting his affable attributes to good use and Rylance, an unknown to me, is a self-effacing standout. 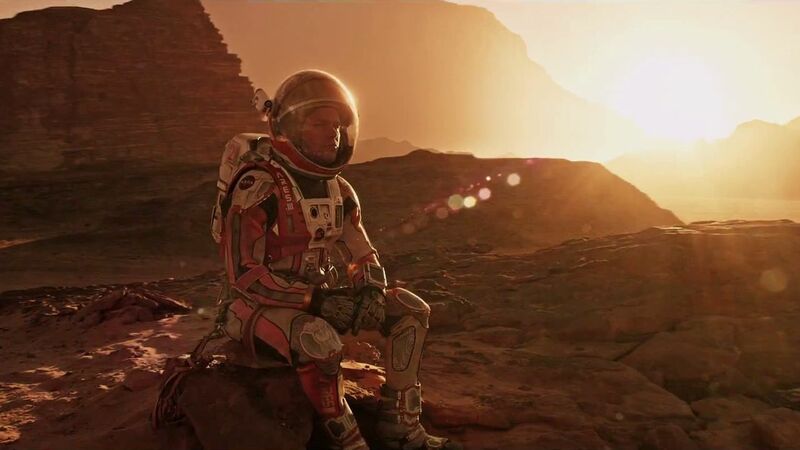 When an exploratory mission to Mars is interrupted by a major storm, the crew is forced to evacuate and make their long journey back to earth, leaving behind their thought to be dead botanist (Matt Damon). Miraculously making his way back to base, the hopeful and self-reliant scientist must either find a way to sustain himself on the lifeless planet for four years when the mission will resume or devise a plan to signal NASA to prompt rescue efforts. With his treatment of Andy Weir's The Martian, Ridley Scott demonstrates his acuity in assembling a sci-fi picture, offering awe inspiring photography and occasionally breathless moments, in a studio film that has absolutely no faith in its material. While treating its audience like adults with a highly scientific and technical screenplay, it alternately panders to the masses with its corny screenplay and empty blockbuster cliches which would feel right at home in a Roland Emmerich production. Damon's character is strangely given no background (along with the rest of the cast) and, though there are no misgivings with his performance, his unrelenting optimism and almost total neglect to explore any of the other caveats of being stranded alone 250 miles from humanity winds up being a real drag. After witnessing the latest cartel horror house as part of an FBI tactical team, a novice but talented agent (Emily Blunt) is recruited by a dubious team of federal agents, led by a law bending cowboy (Josh Brolin) with the aid of a mysterious liaison (Benicio del Toro), in an effort to root out a nefarious drug lord. Sicario is gripping, murky and unrelenting, brilliantly directed by Denis Villeneuve, with crisp, haunting cinematography from Roger Deakins, and superb performances from the well cast principle performers. Not only serving as a petrifying imminent issues movie and conversation stirrer but standing on its own as a meticulously crafted thriller, even if these lines are blurred in the end as the film lends itself more towards a revenge picture. After acquiring an arsenal of automatic weapons, a street gang declares war on the LAPD, focusing specifically on the soon to be closed Precinct 13 station house whose only hope for defense is a novice commander, a few administrators, a victim of the gang's coldblooded violence seeking refuge, two prisoners on layover from a prison transport, and a short supply of weaponry. John Carpenter's Rio Bravo inspired Assault on Precinct 13 is stylized and surprisingly low key, offering well drawn characters speaking cheesy though admittedly amusing dialogue. The finale is anticlimactic but is preceded by a great escape attempt sequence. A Puerto Rican slum kid is on trial for the murder of his father, an open and shut case as far as members of all-white mostly middle aged jury is concerned. As the restless tribunal settles into the jury room to deliberate, anxious to depart on the mercilessly hot summer day, one lone juror insists on respecting the defendant's right of due process and thoroughly examining every bit of evidence. For his feature film debut Sidney Lumet took his know how from an early career in television and, through the brilliant use of lighting, close ups, and camera angles, the benefit of a tried and tested group of veteran actors, and an enlightened, informative microcosmic treatise on the legal system by Reginald Rose, transformed a one-set story into one of the finest dramas ever put to film. 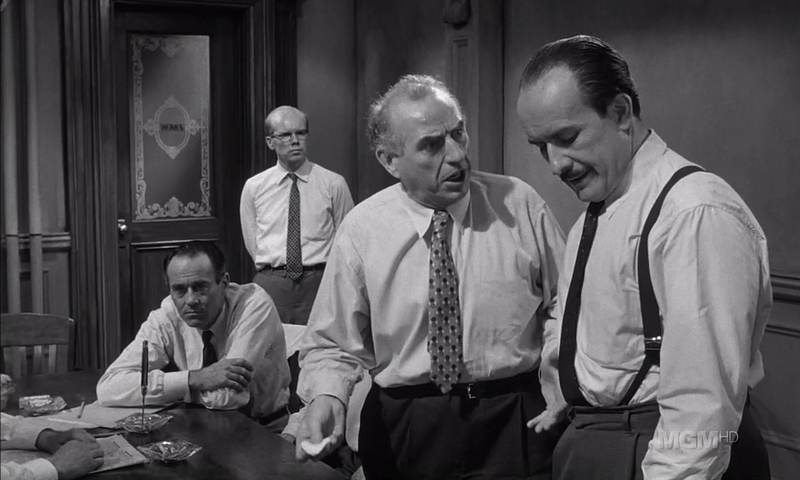 Atop the fine cast (without forgetting to mention a supremely composed turn from a hostile and bigoted Lee J. Cobb) stands Henry Fonda in one of his most nobly idealistic and memorable performances. The story of a brazen, arrogant young Parisian street performer and amateur wire walker who, after seeing a sketch for the under construction World Trade Center buildings in a magazine ad, saw his life's dream of breaking into the towers, gaining roof access to the 94 floor structures, running a steel cable across its 140 foot gap, and performing one of the most daring stunts ever fathomed. 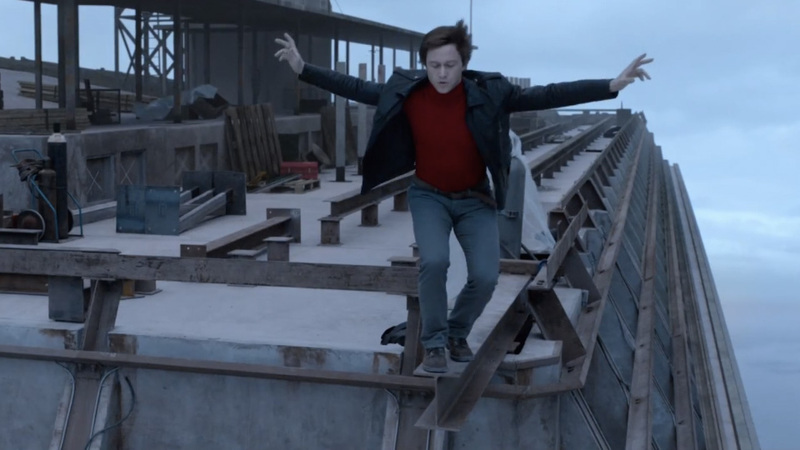 Although the film version of Phillipe Petit's unrivaled triumph offers nothing in the way of character development, lacks narrative drive and tension, is overly cheesy, features a servicable but unremarkable Joseph Gordon Levitt star performance, wastes Ben Kingsley in a throwaway role, and feels like a literal live action translation of James Marsh's superlative documentary Man on Wire, it is worth the price of admission alone for the special effects, generally for director Robert Zemeckis' masterful use of 3D and specifically for the queasy, awe inspiring, unspeakable high wire act of the title. A once vile drunk and murderous outlaw (Clint Eastwood) lives a reformed life on his barren pig ranch, a widower struggling to raise two young children, at the close of the Old West. When a prostitute is disfigured by visiting cattlemen in the town of Big Whiskey, Wyoming a bounty is placed on their heads (against the orders of the no nonsense sheriff (Gene Hackman)) calling the aged, out of practice gunslinger along with his long serving associate (Morgan Freeman) back to his vicious ways. Clint Eastwood's Unforgiven is a stoic, uncompromising meditation on killing that turns the Western on its ear. Crafted from a thoughtful script from David Webb Peoples, it offers painterly scenery, a spectacularly haunting and meaningful finale, and an outstanding cast with tired, worn, and soberly powerful performances from Clint and Freeman, a brilliantly complex and hardened turn from Hackman and fine support from Richard Harris, Frances Fisher, and Jaimz Woolvett.